“The Natural Thinning Hair Solution will achieve exceptional results, This product is useful for either men or women and is safe and easy to apply." The scientific designers at the Ageless Derma Skin Care Company are proud to introduce their latest innovation in the form of a product that will control hair loss and allow for the regrowth hair. 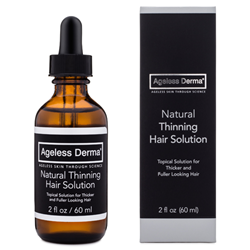 The Ageless Derma Natural Thinning Hair Solution has been developed using naturally derived chemical compounds, herbs, and extracts for non-toxic yet highly desirable results in hair thickening and regrowth. With Ageless Derma Natural Thinning Hair Solution, the user will experience hair that has a renewed volume, is thicker, and appears fuller within just 60 days of usage. The hair will not only have grown thicker, but it will also be strengthened and nourished. The healthy ingredients included in the Natural Thinning Hair Solution are what makes this a superb addition to the hair and skin care routine of anyone whose hair is beginning to thin out or who wishes to have a thicker mane with more body and bounce. A specially blended formulation of alpha hydroxy acids (AHA) derived from natural bee’s honey will cleanse the scalp free of grime and bacteria buildup that can otherwise kill skin cells lying on the scalp’s surface. This dirt and bacteria left unchecked will also create an oily atmosphere that bogs down hair strands and aggravates the skin. The AHA in Ageless Derma Natural Thinning Hair Solution will cleanse the scalp thoroughly, ridding it of this grimy buildup and residue from hair products that have been used over time. The AHA also works to exfoliate the skin, removing the dead skin cells and bringing health back to the entire scalp area. Hair follicles will unclog and new hair will be free to grow and flourish. AHA’s work on exfoliating the scalp allows the Natural Thinning Hair Solution to be absorbed faster and more completely. This lets the nourishment and stimulation of hair follicles work quickly and efficiently. The Ageless Derma Natural Thinning Hair Solution is made with a Cayenne Pepper Extract to invigorate and feed long-dormant hair follicles, allowing the follicles to grow and flourish. The optimal environment for hair growth due to a newly enlivened and healthier scalp is put into place. Herbal experts consider Cayenne Pepper Extract to be an essential ingredient for renewed hair growth and stoppage of hair loss. It can stimulate blood circulation in the scalp, increasing blood flow instantly and acting as a catalyst for the additional substances (including other herbs) that are placed in this solution. The blood is targeted towards areas of the scalp that are most in need of aid. Ageless Derma products are formulated in FDA-approved Labs. All ingredients are inspired by nature and enhanced by science. Ageless Derma products do not contain parabens or other harsh chemicals, and they are never tested on animals. The company has formulated five unique lines of products to address any skin type and skin condition.